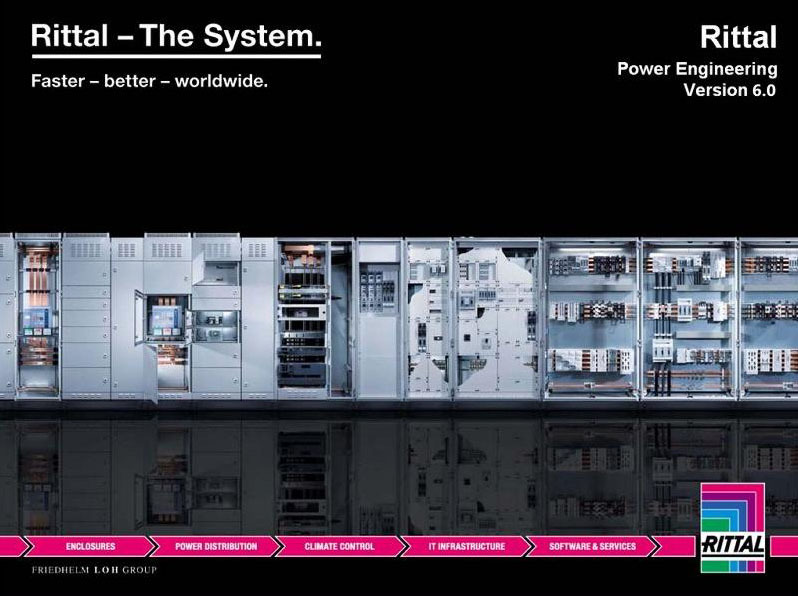 Rittal’s RiLine60 shrouded busbar system has been developed to distribute power up to 1600A and with an extensive range of adaptors allows design engineers total flexibility. With fast assembly and ingenious design RiLine60 is ideally suited for power switchgear systems and automation control panels. To assist in reducing design and installation time Rittal’s RPE design software has been developed for the design and creation a parts list for a distribution system. 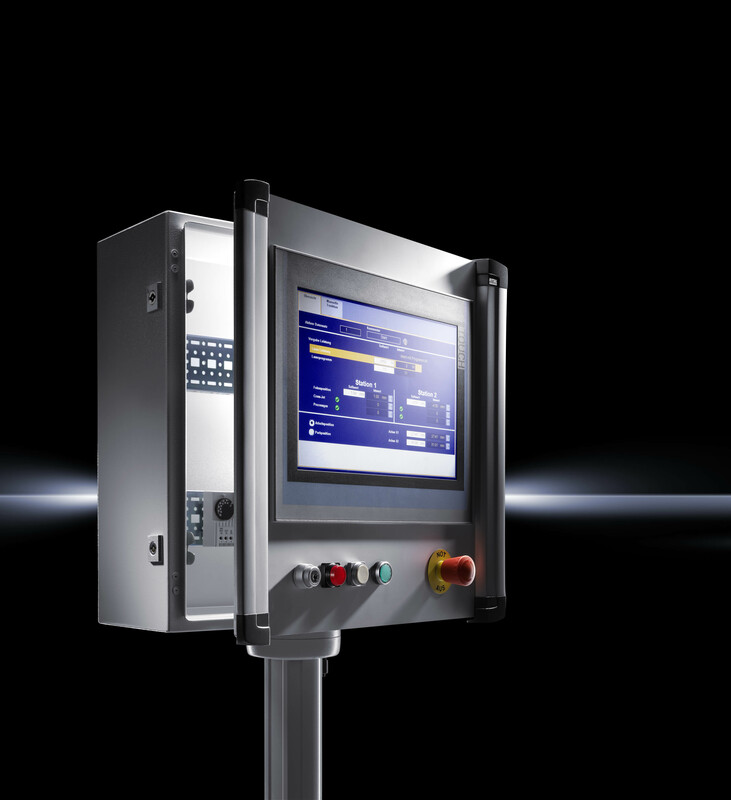 The RPE software has been designed to integrate RiLine60 into standard Rittal enclosures: TS 8, SE 8, AE, CM and KS. Extensive testing has provided heat loss data for the following manufacturers: ABB; GE; Hager; Mitsubishi; Moeller; Schneider; Siemens and Terasaki. On selection of the type of enclosure, number and manufacturer of the devices, the RPE software will generate a CAD drawing of the system and calculate the heat loss within the panel. Another key feature of the software is the ability to produce a design and routine verification document that complies with the IEC 61439-2 standard. All the features of the RiLine60 and RPE design software will enable the design engineer to save time and offer a safe and reliable power distribution system. Rittal’s new operating housings based on AE with handle strips, unveiled at this year’s Hanover Fair, have been noted for their attractive eye-catching design, based on the support arm system system CP 60/120/180. Supplied as standard, the new operating housings with handle strips benefit from a standardised design and operation and replace the existing range of sheet steel operating housings. Encompassing many new and enhanced features, such as rear or front access for servicing, an aluminium front panel easily dismantled for machining, lock with integral door runners for easy locking and uniform interior installation via Rittal system accessories. Available in 10 standard sizes, ex-stock, with protection category IP55, Rittal’s new housings are elegantly fabricated, with high functionality which will stand out thanks to the modern, attractive design, one-man assembly and support arm connection. 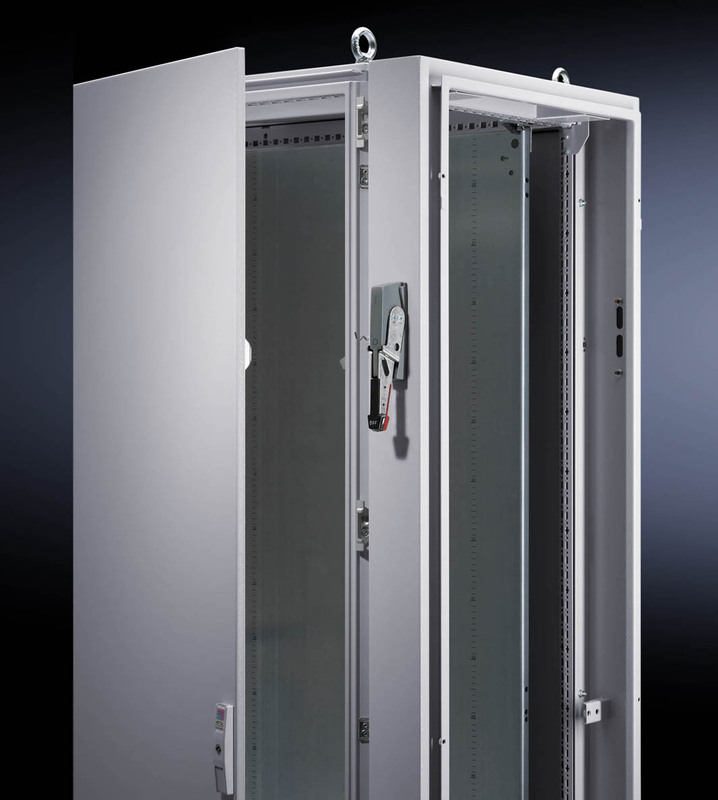 Featuring a raft of technical updates and design features, Rittal’s TS 8 isolator door cover range, prevents operators from opening the enclosure and touching live electrical components. The isolator door cover is mounted on the side of the enclosure to which an actuator lever or isolator switch, as the master switch, can be integrated. As a result, the door can only be opened when the isolator switch has been activated and the electricity supply to all components in the enclosure has been disconnected. A complete row of bayed enclosures can be made safe using a single isolator door cover. The door of the neighbouring enclosure is then operated via the adjacent door latch. Easy to assemble, the 125-mm-wide isolator door cover can be mounted on either the left or right of the enclosure by a single person. The revised locking mechanism consists of a small number of compact parts, is easy to assemble and can be deployed for all approved actuator levers. Standard side panels can be fitted on the side opening of the isolator door cover with automatic potential equalisation. Peter and his wife have been involved with the Daisy Appeal charity for some time and have been working hard to help raise funds for 2 new cyclotron scanning machines to be located, one at Hull University and one at Castle hill hospital Hull. These units are intended to assist in the training of the new generation of doctors and surgeons. The machines and specifically designed centre to house them cost £7.5m which has to be funded entirely from charitable donations. Peter started his expedition in Africa on the 26th September spent 7 days walking the mountain which is 5895 meters high which is the highest point in Africa. The money raised will contribute towards the purchase of the machine and will help many people over a long period of time. 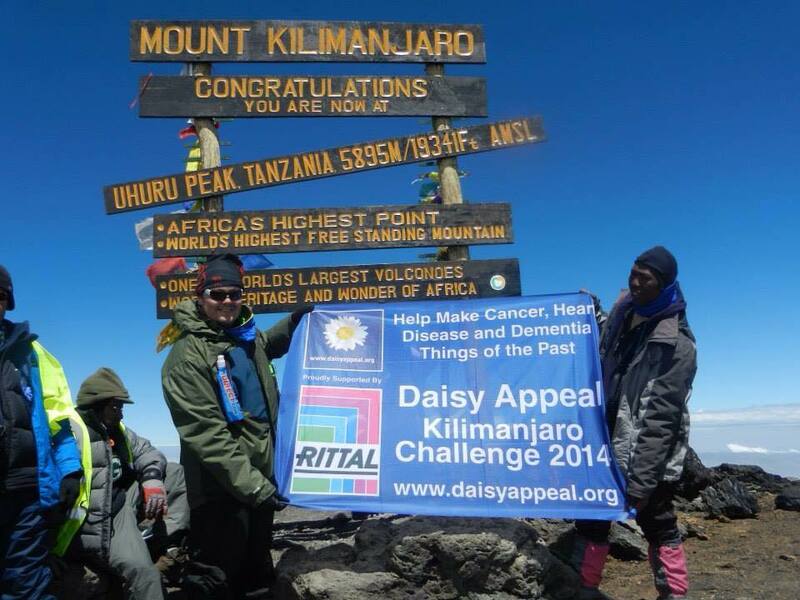 So proud of Peter, and thanks to all that supported and sponsored him so far.